Wilderness Wildness and the Wild | Wrangell - St. Elias Park and Wilderness. 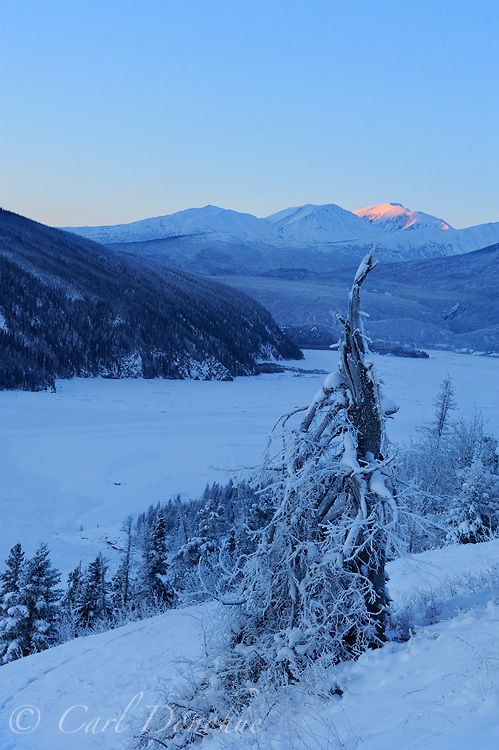 The Chitina River, frozen in winter, and it’s confluence with the Copper River, as the early sunrise begins over the Chugach Mountains. Alpenglow catches the peaks of the mountains, as the frozen river valley awaits the morning glow. Chitina River, Copper River and the Chugach Mountains, Wrangell – St. Elias National Park and Preserve, Alaska. This page is a work in progress. Presently its just snipped and pieces of ideas I jotted down. To be edited! This page is about wildness, and the wilderness of Wrangell – St. Elias National Park and Preserve. Bears are made of the same dust as we, and breathe the same winds and drink of the same waters. A bear’s days are warmed by the same sun, his dwellings are overdomed by the same blue sky, and his life turns and ebbs with heart-pulsings like ours….His life not long, not short, knows no beginnings, no ending. To him life unstinted, unplanned, is above the accidents of time, and his years, markless and boundless, equal Eternity. – John Muir. The distinction we tend to make between ourselves and nature goes to relationship; people have long been ‘part of’ what we call nature, even wilderness. For as long as there’s been people, I imagine. But the difference is we no longer embrace the world around us on its own terms. Grizzly bears remain where we say they can remain, and in the numbers we define. The same is true with most of the natural world today, and that is immeasurably divergent from years gone by – and certainly from some older cultures. Physically sure, we’re a ‘part of nature’, just like someone might be a ‘part of a family’ .. but families break up and change and people go their separate ways, for various different reasons – but they may see themselves as no longer part of a given family. The mountains do, I believe, need our awareness and appreciation every bit as critically as we need their grandeur, as we need the Robin’s song, the wolf’s wild eyes and the grizzly’s power. It’s a 2-way relationship, or there is no relationship at all. I had this conversation years ago with a great friend, camped high on a mountain top in Wrangell – St. Elias National Park. Wrangell – St. Elias has helped teach me about wildness, about what wilderness really is. And it’s the exploration of that which has produced this book, and this website. It’s this exploration that’s produced me, Carl. And it’s that process that will produce a new me, tomorrow, and the next day, and so on. Wilderness is really, I think, a process. An ongoing journey, not a destination. We don’t arrive at wilderness, we experience it, we journey through and with it, we live it. We don’t control it, we don’t define it, but we allow it to shape and define us. That’s wildness, and that’s just a tiny part of what Wrangell – St. Elias National Park and Preserve has given me. This project is my humble attempt to give something in return.